Ten years ago, on Sept. 20, 2001, President George W. Bush announced for the first time that in response to the terrorist attacks of 9/11 the U.S. was starting a "war on terror," and he asked every nation to help. Four days later, against the advice of many of his generals, Russian President Vladimir Putin agreed, creating a bond unlike any the U.S. and Russia had built since World War II. But as with many of the unlikely relationships the U.S. formed after 9/11, the reasoning behind this one was not just solidarity or common cause. Countries around the world realized the practical appeal of a war on terrorism. Over the past ten years, it has become a seemingly permanent call to arms, a kind of incantation used to dodge questions, build alliances and justify the use of force. No one, not even Bush, grasped this as quickly as Putin. Even before Putin became Russia's President in early 2000, and long before the Twin Towers fell, he had invoked the idea of a war against global terrorism to justify Russia's war in Chechnya. The terrorism aspect, at least, was true. Chechen separatists, who renewed their centuries-old struggle for independence soon after the Soviet Union fell, had resorted to terrorism as early as 1995, when they seized a hospital in the Russian town of Budyonnovsk and held more than 1,500 people hostage. Then in 1999, a series of apartment bombings, also blamed on the Chechens, killed hundreds of people in Moscow and other Russian cities. Putin responded by launching Russia's second full-scale invasion of Chechnya in less than a decade. "He received carte blanche from the citizens of Russia," says Mikhail Kasyanov, who was Russia's Finance Minister at the time. "They simply closed their eyes and let him do whatever he wanted as long as he saved them from this threat." There was scant evidence, however, that the Chechen rebels were part of some global Islamist terrorist network, as Putin and his government repeatedly claimed. The leader of the separatists at the time was Aslan Maskhadov, a former Red Army colonel who was closer to communism than Islamism, and there was no proof that he received much help from abroad. "Still, all official statements said that we are fighting a war against international terror," says Andrei Illarionov, who served as Putin's senior economic adviser between 2000 and '05. "Of course, nobody outside Russia bought it." In the West, Putin's war in Chechnya thus enjoyed little sympathy. The Chechen conflict was seen as part of a rebellion that Moscow was trying to crush, and the atrocities allegedly committed by both sides earned widespread condemnation. In late 1999, when Bush was campaigning for the presidency, he vowed to start urging an end to the war. "Even as we support Russian reforms, we cannot support Russian brutality," he said during a speech at the Reagan Library in California. "When the Russian government attacks civilians, leaving orphans and refugees, it can no longer expect aid from international lending institutions." Some days later, Condoleezza Rice, who later became Bush's National Security Adviser after his election, reiterated the need for financial pressure against "what is really a quite brutal campaign against innocent women and children in Chechnya." And in the fall of 2000, then U.S. Secretary of State Madeleine Albright told the U.N. that the Chechen war "has greatly damaged Russia's international standing and is isolating Russia from the international community." But when Bush announced his own war on terrorism, all this rhetoric quickly evaporated. Putin, who had been the first to call Bush with his sympathy after learning of the 9/11 attacks, graciously offered to help with the invasion of Afghanistan. He let the U.S. ship supplies through Russian territory and did not object to the U.S. setting up bases in Central Asia, where the local despots quickly caught on to the opportunity. Uzbek President Islam Karimov, for instance, allowed the U.S. to build a permanent base, perhaps hoping that his new alliance with the war on terrorism would help reduce U.S. scrutiny of alleged human-rights abuses in Uzbekistan. "It all flowed naturally into the picture of a global war on terror," says Kasyanov, who by that time had been promoted to serve as Putin's Prime Minister. "There was no more criticism ... It just ceased to be a thorny issue." By the summer of 2000, Russia had defeated the Chechen separatists and installed a puppet government led by the Kadyrov family, a Chechen clan loyal to the Kremlin. But claims of wholesale violations of human rights, including torture and extrajudicial killings, continued to surface as the Kadyrovs consolidated power in Chechnya. The need to remind the world that Russia was still fighting the war on terrorism remained, and Putin began to claim ever stronger links between Chechen rebels and the global jihad. "Exaggeration of these links was one of the goals," Kasyanov recalls. 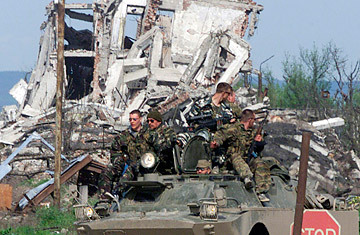 During and after the 2004 terrorists siege of a school in the town of Beslan, where hundreds of hostages died, the Russian government claimed firm links between the Chechen terrorists and Islamist networks such as al-Qaeda. Soon after the siege, Putin said that nine of the hostage-takers were from the "Arab world," a claim that was never substantiated. Asked why he had decided to storm the building instead of trying to resolve the crisis through negotiations, Putin fumed: "I don't tell you to meet Osama bin Laden and invite him to Brussels or the White House for talks." But the very idea of a war on terrorism had unnerved some officials inside Putin's own government. "Terrorism is a method of waging conflict," says Illarionov, Putin's former adviser. "How can you fight a war against a method? The very idea is nonsense. It's like announcing a war against tanks." In early 2005, Illarionov resigned from his post in the Kremlin, citing the rollback in democracy that followed the Beslan siege. Kasyanov had resigned in early 2004 for similar reasons, going on to join the opposition. Yet the idea of a global war on terrorism remains one of Putin's key political narratives. It is trotted out to this day after every terrorist attack in the Russian heartland and during most discussions with Western leaders, who see it as a firm bond in their alliances with Moscow. Since Bush left office, President Barack Obama has let the term fade from White House rhetoric, usually preferring to name a specific enemy of the U.S. But the use of the phrase has spread far and wide. During this year's Arab Spring revolts, besieged dictators from Egypt to Libya and Syria have claimed that the revolutionaries trying to overthrow them are in fact foreign terrorists with links to the global jihad. Few Western governments have taken these claims seriously. But 10 years on, Bush's idea of a global war on terrorism is still more often used for propaganda than to prevent more attacks like 9/11. Changing that could take many more years.